Let’s face it, ladies love their makeup! Nothing clutters up a bathroom faster, however. 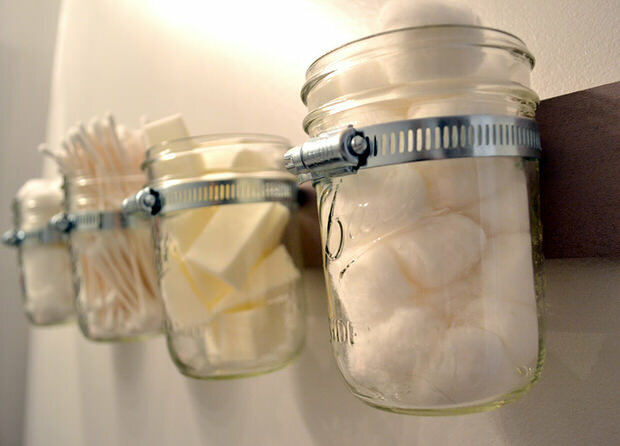 We all need some creative makeup storage ideas, because no matter how big or small your bathroom is, no one wants it strewn everywhere! 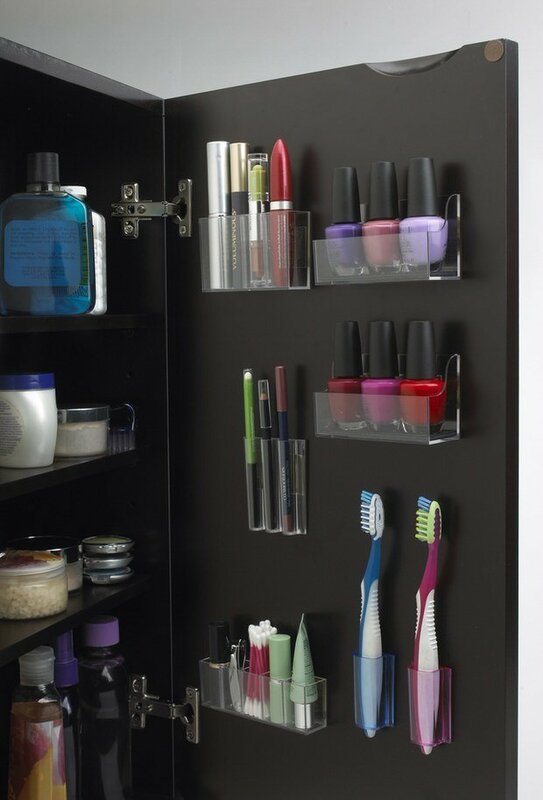 So put away the pocketbook, and use your space more wisely with these DIY makeup organization ideas! 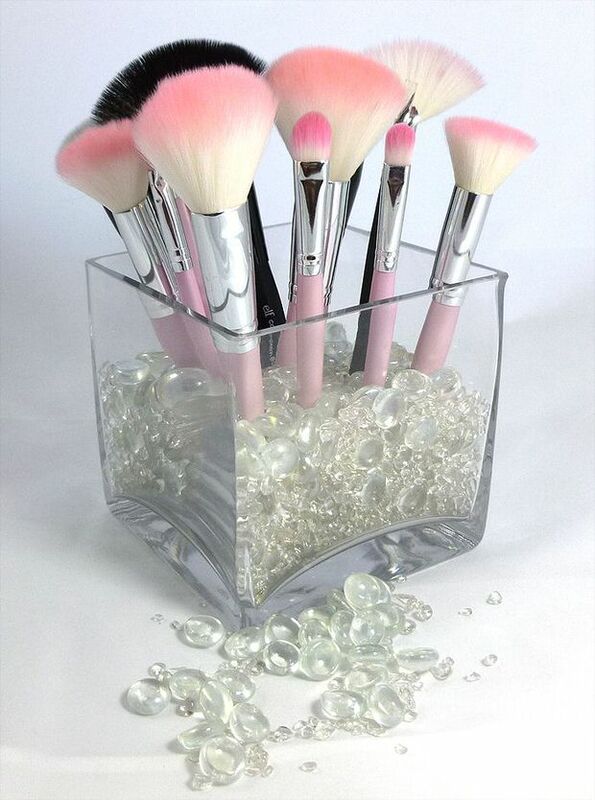 Our first makeup organization idea is from ‘My Beauty Now‘, and they have this easy and quick storage solution for brushes! ‘Laura Thoughts‘ has this great tutorial for her magnetic makeup board, and I love this! She used sheet metal covered with fabric, and then small magnets glued to the makeup cases themselves… Brilliant makeup organization idea! 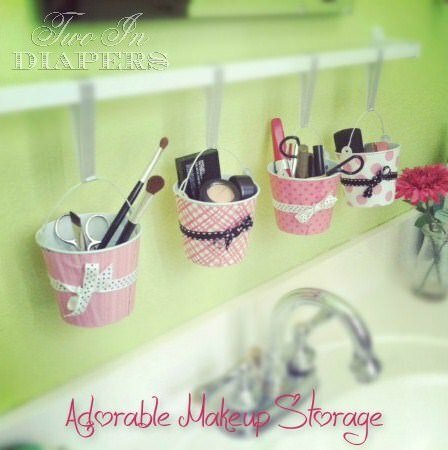 This hanging makeup organization DIY by ‘Two in Diapers‘ is unbelievably cute! Our next project is from the ‘Liz Marie Blog‘. 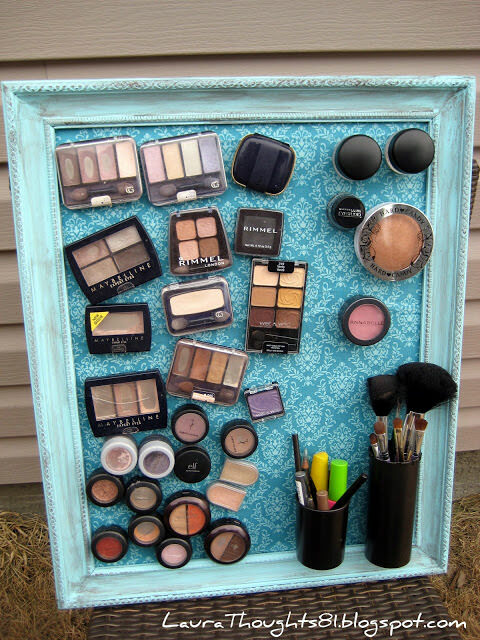 She created this Mason Jar Makeup Organizer, and her tutorial really is easy to follow. So these Stick on Pods are a great idea, but why couldn’t you make this a DIY makeup organizing project with double sided tape and dollar store office storage? ‘Ms. 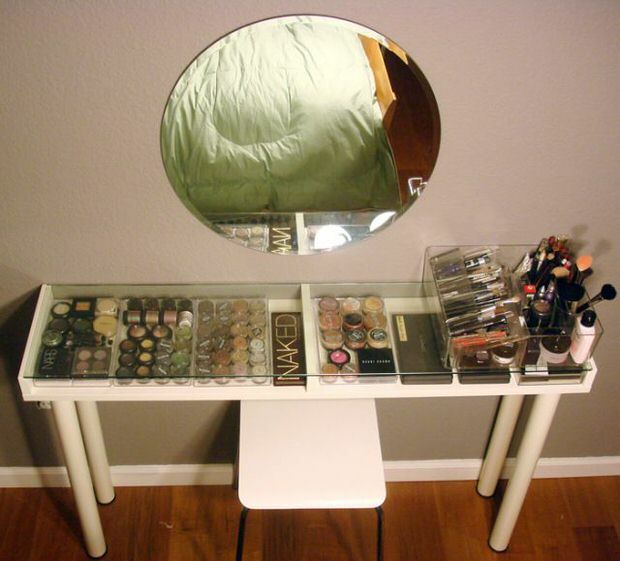 Tapioca‘ created the piece de’ resistance in DIY makeup organization… a makeup storage vanity from Ikea parts! Check out her site to see how she did it… I’m a little worried my fourteen year old daughter might catch wind of this project! Does your jewelry need a little storage help while we’re at it? 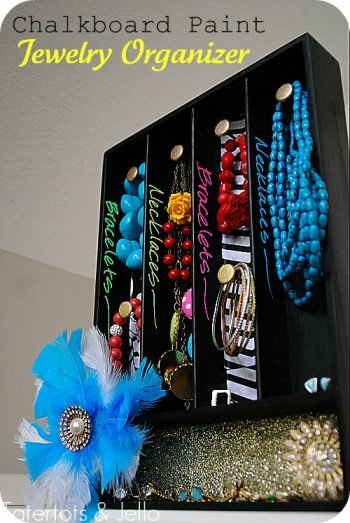 Here are a couple good ideas for DIY jewelry organizing. 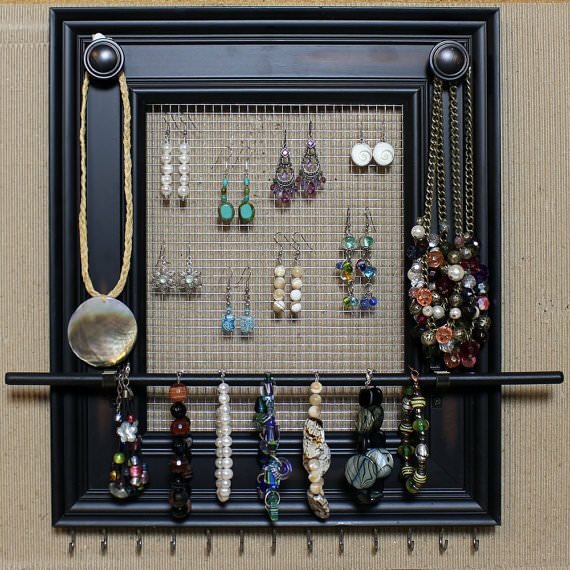 Take some DIY inspiration from Etsy seller HedCraft and make a picture frame jewelry organizer! We hope these DIY Makeup Organization Ideas has you on your wan to a more streamlined morning routine! We think you will want to jump right on over and check out our posts on How to Clean Makeup Brushes and DIY Vanity Mirrors! You might also want to try our post on Best Cruelty Free Makeup Brands!